to create a perfume ' which smells like a woman'. Chanel N°5 is a very complex fragrance which does not allow any of the fragrant components to be isolated out of the composition, what was exactly a request of the great Chanel – the perfume should not smell like a rose, or a lily of the valley, but as a composition. 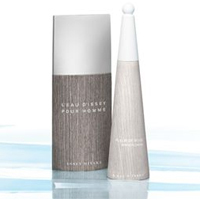 Famed designer Issey Miyake of Japanese origin launched his first designer perfume in 1992 and has since created an acclaimed line of fragrances considered to be among the best in the world. He expanded to include a fragrance for men two years after his debut, and he built upon this foundation gradually for a full line of perfumes and colognes today.